Enterprises and operations of every kind are staking their daily operations and their future viability on data networks and information systems that are unprotected - in most cases - by physical, visible computer security devices. The overwhelming majority of the $170 billion spent annually on cybersecurity goes to these invisible solutions. Business leaders are betting everything on security solutions that they cannot see. HUNTSVILLE, AL, January 31, 2019 /24-7PressRelease/ -- The frenzy of venture capital thrown wildly at dot-com schemes in late 1990s' Northern California was referred to often as a new kind of Gold Rush, or even as "the Wild West." Ingenious-sounding uses for the personal computer – taken for granted now, but which were just then rapidly penetrating practically every North American household – were funded generously, even in instances when their business or transactional basis was not clear. For a software application to be "monetized" was considered almost an added attraction and, too often, something that could be postponed. A bubble ensued and burst. Looking back, one wonders why such an obvious outcome could not be foreseen. A different kind of Wild West prevails today. Enterprises and operations of every kind stake their daily operations and their future viability on data networks and information systems that are unprotected by physical, visible computer security devices in most cases. Cyber-defense programs and software-based solutions abound. In fact, the overwhelming majority of the $170 billion spent annually on cybersecurity goes to these invisible solutions. Business leaders are betting everything on security solutions that they cannot see. Computer security devices that can physically block the entry of cyber threats to your data system are readily available, and yet most enterprises have been strangely slow in adopting them, even though they are the solutions one actually can see. This unaccountable lack of protection is a big, inviting gap in the cybersecurity perimeter of most of today's computer operations. Devoting so much attention to the sophisticated, constantly evolving world of cybersecurity software while leaving visible data ports and connectors unguarded without physical computer security devices has been described as analogous to investing in an array of electronic home security measures – such as remote viewing, remote monitoring, and remote control of everything from pet food to the thermostat – without even locking the front door. The threats your data system faces today might make the Wild West look tame by comparison. Viruses are the James Gang of cyber threats, the most widely known – but by no means the only – hazard. As programs written to alter the way a computer functions without permission of the user, viruses initially were introduced just to show off the aptitude of the hacker. The next generation of viruses was destructive for no particular reason. Then, soon, somebody decided to "monetize" viruses, greatly accelerating their propagation. Now ransomware, spyware, and phishing are just a few of the costly, often debilitating, disruptions that can enter your vital data network and information system at any time. In fact, the reasons to install computer security devices are growing constantly. Among the Top Ten Secure Computing Tips from the University of California at Berkeley is the suggestion to "never leave devices unattended." It is immediately evident that the devices we use in the workplace are too numerous – and even today too bulky in total – to take home with us every night. Even in a BYOD (bring your own device) workplace – a threat-rich environment if there ever was one – there are shared devices and resources that remain at the workplace when everybody goes home. Computer security devices – the kind you can see – are the answer. Blocking the hundreds of data ports and connectors that exist in the workplace with computer security devices designed precisely for the task is the only way to truly complete your cybersecurity perimeter. But blocking your ports and connectors alone is not enough. Making sure that authorized persons have ready access is just as vital to the efficiency and effectiveness of your organization as blocking them is vital to security. Locks and keys for your ports and connectors are the answer for getting both vital benefits at the same time. FedTech, a resource for government agencies' IT departments, includes these measures among their "6 Network Security Tools Every Agency Needs." Network Access Control (NAC) and Authentication and Authorization are among these top cybersecurity solutions. Yet, the initiatives first implemented to achieve them consisted largely of complex, sometimes elaborate, programming solutions for identifying specific users based on recognizing their devices and even their network roles. Often the data within a system was sectored to respond only to certain layers of authorized access. The intelligence and logic required to affect these measures are impressive. Yet, even at the federal level, even when national security is at stake, the physical points of access – ports and connectors – are still unprotected by computer security devices in many cases. The locks and keys that make this possible are still, all too often, missing. Fortunately, computer security devices are abundant and readily available. The Connectivity Center's Smart Keeper collection of computer security devices provide PC security without sacrificing the access that makes computer systems so vital to operations. 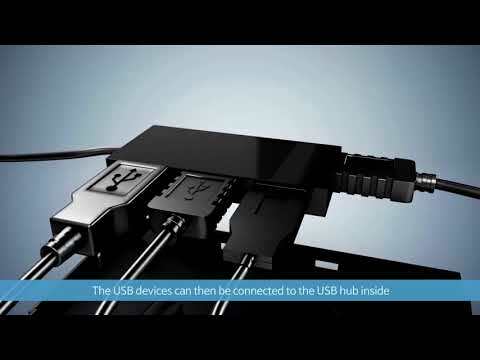 Link Lock connectors and the Link Lock Hub serve not only as secure USB connections, but also lock your devices so that they cannot be removed without authorized access. The hundreds of other solutions include a variety of locking 4K high-speed cables and both the Enterprise and Professional series of the Smart Keeper USB Port Lock Key. Enterprises depend on the vital flow of data, uncontaminated and with controlled access, and that is what is provided at The Connectivity Center. The Smart Keeper collection, the locking USB connector, and the lockable USB key are some examples of the comprehensive collection of computer security devices offered.